"Hello Smile and Wave readers! It's Stacie from Gingiber, and I am pleased as punch to be offering you lovely readers a chance to win a $20 credit to my shop! Gingiber is my online shop, but did you know that it is my happy place? Nothing makes me feel more content than sitting down and expressing a creative idea via paper and pen! My goal is to create products for children and adults alike that make people just as happy as i am! I know that it is only October, but I thought that I would share with you some of the holiday goodies that I have been working on. I am participating in a holiday craft show this year, so my home is currently a Gingiber factory! You can read about my progress on my personal blog. To enter to win this contest leave a comment below with what's on the top of your holiday wish list. Winner will be announced on Tuesday. The top of my holiday list is to get this baby here happy and healthy! The top of my holiday wish list is currently a new pair of Minnetonka moccasins. My current pair is very worn in, but also very loved! I would kill for an old-school Gameboy. On the top of mine is a Blythe doll. I have been wanting one for the last few years and am finally treating myself with one if Santa fogets to leave one under the tree. A serger is on the top of my list! I want to see the Cirque du Soleil show coming to town. I hope I can go! The top of my holiday wish list is for a white christmas! I'm from New Zealand, so Christmas is summer time, but this year i will be in Bordeaux, France, so I am hoping for some lovely snow! I really want a cricut! A sewing machine!! I'm in the Home Ec class and have fallen in love with sewing :) My old one is on it's last legs so it would be great to get a new one! hmmmm... a happy, healthy holiday with my family? truthfully, i have not even thought about the holidays much yet : ) i will on november 1st though! an instax mini camera in brown! a canon rebel dslr.. its a long shot-- but definitely on the top of my list! hmmm, i honestly haven't thought about a wish-list yet. i think just time off from school and work would be wonderful! A top quality juicer, and dehydrator. crochet books,hoptimists http://www.hoptimist.com/page_11.php - they are sooooo cute! and new pair of Dr Martens! This is such an AWESOME giveaway!!!!!! On the top of my wishlist is some handmade toys or a polaroid camera. On the top of my list are the perfect Christmas stockings for me and my husband. We don't have any yet, live far away in Czech Republic and perfect stockings would be the perfect reminder of home! A sewing machine. I really want to sew dresses for my two year old girls. for my baby to move past the only-consoled by mama phase. Mama needs a break. SLR camera, a crueset (caribbean) pot, a blendtec blender, and to get my ipod fixed! The top of my holiday wish list is for a fun trip to Maui for New Years!! Hopefully a job as I am still unemployed. a new backpack to carry all of my heavy university textbooks in! yay. On the top of my list would be a seing machine!! top of my list would be a fuji instax 210! i would love a red holga. Road trip along the coast! I would love to receive a gift certificate for Urban Outfitters! I'm too practical...I always wish for home improvements to be made....a new bathroom would be at the top of my list. top of my list: a little extra shut eye and some yummy baking! ideal: the JOY and unity back to my marriage. We're unemployed, besides a job, really what I hope for is lots of family time and baking goodies with the kids! On the top of my wishlist is to move with the least amount of stress possible. We'll be moving two days before Christmas, eek! On the top of my wish list is a new pair of Toms! I would really love a sewing machine this year! I've recently gotten into sewing & would love to be able to create at home! Thanks for the giveaway! The stocking is adorable! Top of my holiday list is a girlfriend for my baby persian cat, Soren. I'd love a new camera, some boots, or a trip to Atlanta for Passion Conference. I love the holidays! The top of my holiday wish list is to work on some projects for myself. A lovely new sewing machine is #1 on my list! I'd really like a few books. I know - so boring. But they're craft books, so that's not all bad! i want power tools! seriously i would love to learn how to make furniture! A new lens for my camera is at the top of my list! a sewing machine. i want to learn how to sew...and learn from you! Mmmm, lovely! Top of my list is pile of scrapbook papers to be crafty all year long! I love the cute little stocking your got from her. So cute. for christmas i want a new dining room table! Wonderful giveaway, by the way! Need or want? The need on the top of my list is some new sneakers. The want is a bias tape maker. practical-wishlist: the new Brooklyn Tweed yarn, Shelter. WISH-wishlist: a camera upgrade. on my xmas list is a new camera! I have wanted a dslr for ever!! I would LOVE a Polaroid camera and film for the holidays! I want an inspiration journal by Donna downey! I would really love new pots and pans for my kitchen, mine are all teeny tiny. I want to have a giant pot of soup simmering on the stove and have friends over for dinner. I'm not even sure right now! Although I've had my eye on a serger! Top of my wish list is an awesome fox locket from etsy....looooove it! 50mm 1.4 lens for my camera! I would love a fancy new bottle of perfume....something I hate spending so much money on for myself, but I love having! A new printer so I can print my pictures at home!!! Chanel No. 5 Sensual Elixir - it smells like heaven(!) but is a bit out of my price range. Lots and lots of fabric! Okay, I REALLY want a serger and the Martha Stewart Sewing Encyclopedia! Vanilla beans! Om nom nom! i haven't thought to much about it to be honest, but a camera bag would be nice. My holiday wish would be to be able to scrapbook a lot this holiday season and maybe get a new pair of grey boots. Because apparently, the last two winters in Utah didn't prepare me? A new digital SLR. Film isn't always fun..
a DSLR, my first REAL camera! a bed! my husband and I for many different reasons have not had a bed of our own for 4 years! I miss it!! I just want to see family for Christmas. And maybe have a clean and organized house. I'm organizing a handmade market (out of my house) for next spring so maybe some extra time? Does Santa grant that one or is there someone else I need to talk to about it? As a grad student who works and lives 3 hours from home, my wish is to get to spend enough time with my family/friends this Christmas. I'm hoping for a new camera, if I'm spoiled enough. I would like a desk or table for my sewing room. I would love a serger, but practically hoping for a Vintage Pearl Vintage Initial Pendant necklace. I would love a Fuji Instax mini...yes! Top of the list is a massage! Beyond that, I wish for everyone to have a happy, warm, love-filled holiday season! We just moved to Germany last month so I'm hoping to get our household goods delivered before Thanksgiving. I bet by the time we get it all it will be time to put up the Christmas tree!? Craft books and fabric always seem to make it to the top of my wish list. Nothing makes me more happy than feeling inspired! Peace and happiness. Sounds corny, but my finals and my wedding are a week before Christmas so I'll just be happy for a moment to breath and love life. Lots of cds and the new Steve Martin novel would be nice...I'm also trying to buy a house so if the bank would hurry up and get me that loan, that would be the best Christmas present ever! A weekend away with no kids. I want a Jo Totes camera bag and an iPod. I'm probably the only person in the world who doesn't have an iPod! Figuring out some cool handmade gifts to give for Thanksgiving and Christmas. Annnd.. learning to sew! I love that little stocking and the owl calendar! On my wish list, a pair of lovely mittens and a matching scarf. top of my list...ha I havent even thought about my list! Maybe a new pair of boots..gosh I have to get thinking!!! My wishes... to share the magic of the holidays with my son (twinkle-lights and all), and maybe a snazzy pair of rain boots under the tree for me. A new desktop computer! My old one konked out the day before I went to college. I'm thinking a video camera of some sort because I love watching old videos we take on our lap top--so something of better quality would be lovely for memories! A new camera is definitely on the top of my wish list right now! Tattoo and maybe a new pair of snuggly boots. red cowboy boots. a girl can dream! I'm really hoping for a bread machine and a garlic press! i have way to many books on my holiday christmas list to name them all! To get the family together in one place! very difficult to organize. My holiday wish is for next year to be less stressful, less rush, more smell the roses! I am determined to make it happen!! Books :-) Always books! I love em. A trip to Chiloe Island! On my wishlist is more time off with my fiancé. We work in retail, for the same company, and lately our schedules have not allowed us to spend much time together. Maybe next week will be better. On the top of my holiday list : spending time with my lovely one! I'm really wanting a Mad Men Barbie doll, Joan in particular. SO unpractical (esp. for the price! but so pretty! The top of my list is to be able to spend the holiday with my family, who live across the ocean from me! The top of my holiday list is a "nook". YAAAAAAAAAAAA! :) My holiday wish list is topped with a new job for my talented boyfriend! A new computer! I just need one sooooo bad!! Well...there are a few things since i'm in the middle east right now and it doesnt seem holiday-ish. Definitely Polaroid film, and lots of it! a cookie jar...I just can't decided what kind. On the top of my wish list is a video camera. I would love watercolour lessons at our local art studio. seeing as i will be spending this holiday season in China the top of my wish list is receiving a box of surprises from my family back in the States! At the top of my wish list is knee-high black boots -- finishing the 30 Day Shred has made it so I can actually wear them with confidence! New throw pillows are at the top of my list! The thing that is on the top of my holiday wishlist is probably a small watercolor set so I can travel around and paint! Anything handmade by loved ones, and after that I dream of a KitchenAid Stand Mixer. Lovely giveaway, I adore Gingiber! I would love a DSLR camera... but maybe some new boots instead! a made by hank bag! I would love to have a holga camera this christmas!! 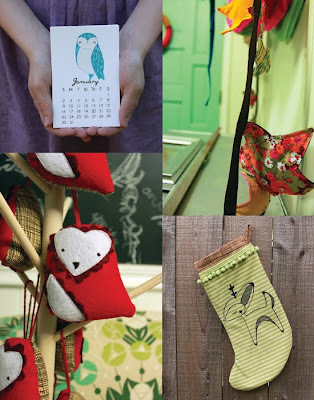 **I love that little deer stocking! I am hoping for a "new" used dutch-style bicycle for riding to class on! I imagine it to be so pretty! I would love a Fuji Instax Mini. It would be so fun to capture memories of our new kiddo with it! On the top of my list is a new lens for my camera. my top holiday list is new tattoo! I new camera. I have an older small digital camera and it's a piece of junk. I dream up having a really nice Cannon or Nikon... oooh. Wishful thinking. A new camera bag is at the top of my wishlist! Yes,that's right: I want headaches for Christmas! w00t. top of my list...adding to my sleeve tattoo, anthropologie dress, darlingtonia mocassins...I have three. Oh well! Don't know yet, I still have some time to think about it, don't I? Maybe winning this giveaway? not much on my list but I am most excited about the dress-up trunk I am making for my little niece and nephew full of vintage treasures! I can't wait for them to open it. i love the fox! at the top of my wishlist is a pair of good boots. Growing up we always made a gingerbread house every Christmas with our Mom, I look forward to picking a theme this year and making one with her for the 24th year in a row! The top of my list includes some uninterrupted sewing time. I would really like it if my mother would finally teach me how to use the thrifted sewing machine she got me, because i have about a million projects cued up! An instant camera...maybe a Fuji Instax 210! wanting to make traditions that my son will love and want to remember as being sweet times!